End Point = 30 Pixel long RGB LED poi capable of displaying graphics by POV. About two years ago I started working with a juggler / performance artist friend. We were talking one evening about how to do something a little special to tie in to his LED show. Now, the LED show was already very special and getting plenty of attention, so we had to do something pretty dynamic and interesting. We came to the conclusion that Persistence of Vision (or POV) kit was needed, and it had to be bright, oh, and it also had to show logos (it has to be able to pay for itself somehow!). So we got thinking about what the essentials were. It needs to be as light as possible, give a good coverage across the performance area, be bright, give plenty of detail when being looked at, be easy to use, be reliable, be resistant to knocks, have a good viewing angle (we’ll get on to that) and lastly, cheap to make. 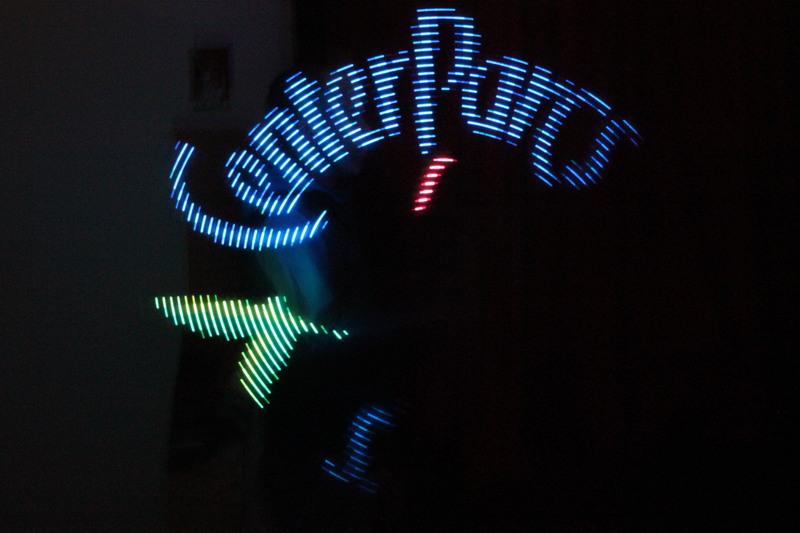 We also needed a painless way to put images and patterns onto the poi for use during a performance. I think that we did most of that except for the ‘cheap to make’ bit. Its just is not possible in the world of juggling kit to make high quality programmable POV / pixel poi as cheaply as many people think it should be. 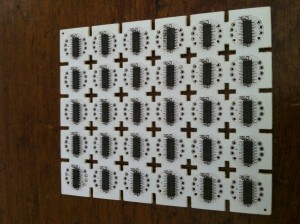 This is a pic of the end product, and keep reading for a idea of how you can do it yourself. 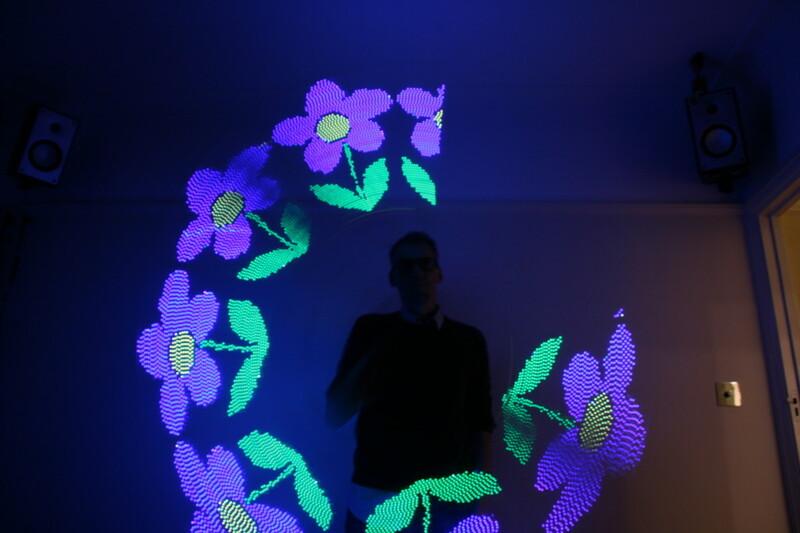 And here is an image of the new pixel poi using APA102 led strips. Really easy to build, cheap, and very fast update rates. This are the first led strips that update fast enough for proper pixel poi use, no speckled effect. 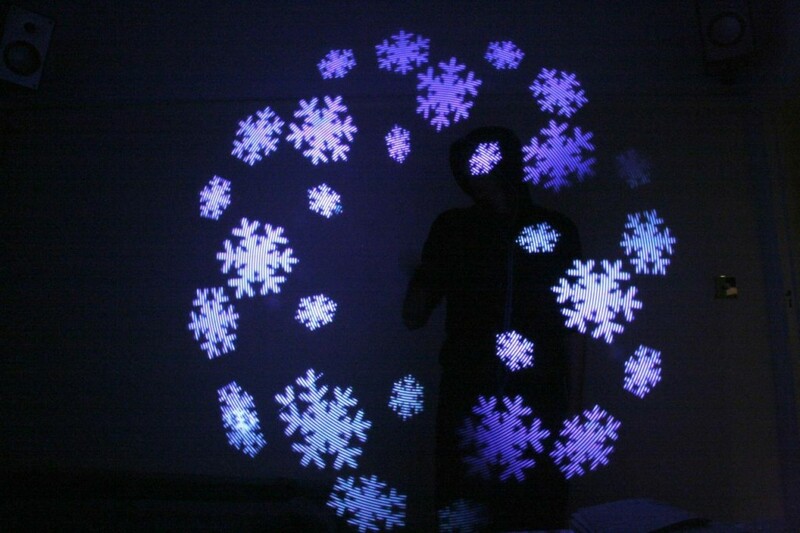 by the way, I realise that the term ‘pixel poi’ has been trade marked, but, unlike the wonderful use of ‘Hoover’, i shall not use it as a generic term, and use Graphic Poi instead, and now we all know what we’re talking about. However, to cut a long story short, and we will get this later, I had to move on from the lovely little Arduino Nano as it just did not have enough umph to do what I was after. In steps the Teensy. The Teensy can be programmed using the Arduino development environment and can run on the same code, pretty much, for most of the basic workings. It has a great advantage over the Arduino in the small form factor end of things, in that it has more storage and more RAM. It does lots more besides but we don’t need to go into that. I ended up using the Teensy 2++ at the time. There is Teensy 3.0 out which is superb, uses the ARM chip and is 32bit, so this is the way to go. But, to note, the 3.0 uses 3.3v and the 2.0 use 5v I believe. As you can see from the pic, both a use small form factor. 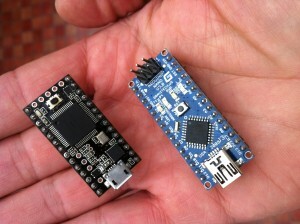 The Arduino Nano uses an FTDI chip, which is on the underside. When you have a look at the library at Adafruit, or any of the other support material for these, you will see that you can programme the colour in a number of ways, the most simple being to use the helper function. 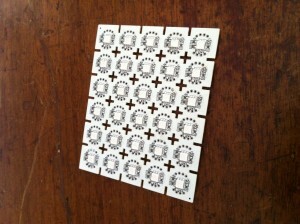 Pop over to BlipTronics to get some more info. As you can see from the above, these addressable LEDS have the chip on the underside. Newer LEDS such as the WS2811 have the chip embedded within the housing of the three colour LEDS, giving a lower weight, and a smaller footprint. It looks like a small black dot. 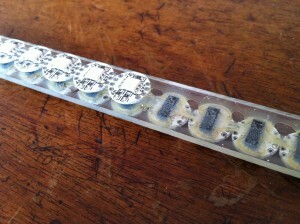 The next step was build these individual LEDs into a strip. This is where the weight started to build up, and why the preferred option is really to use one of the high density pre-made pixel strips that are now available. 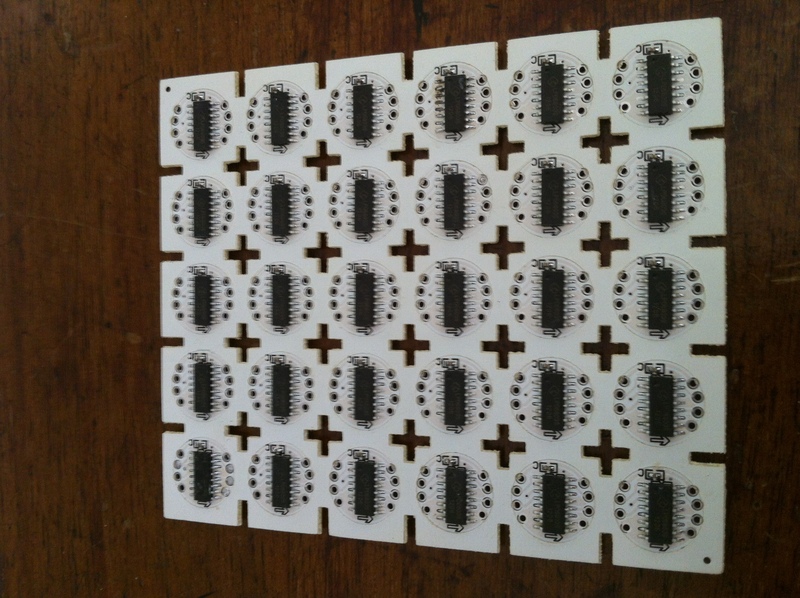 Each of these type of pixels has four solder points on each side of the LED. They are ground, negative, clock and data. These need to be wired to their neighbours. 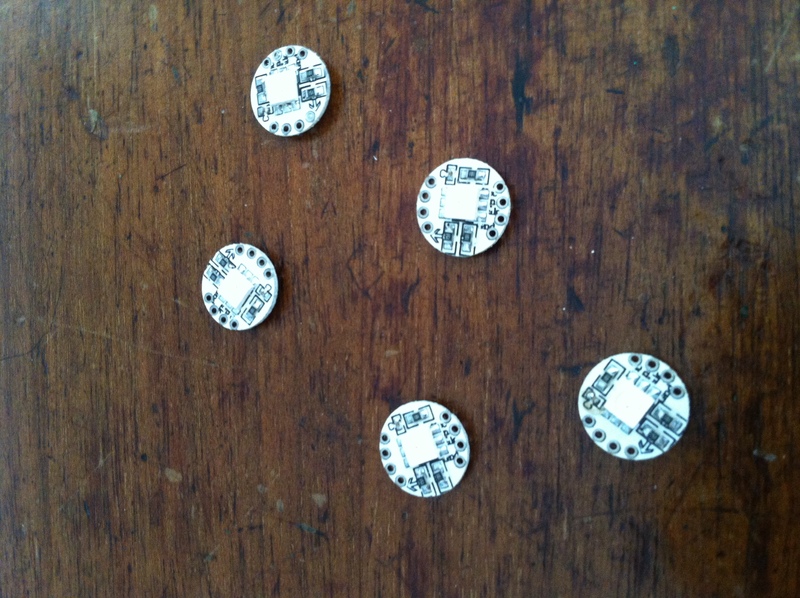 I just soldered them directly using a solder bridging technique for the ground and live solder points on each side. Not pretty, not very light, but it certainly worked. So, as you can see from the above pics, I used a strong glue to fix the pixels onto a clear polycarbonate strip. This has proved to be very secure. As you can also see from this pic, we are only using pixels facing two directions. Our tests showed that you really only need pixels to face away from each other to give a good spread of light to the audience if you have nothing close to the pixels, and you use a good casing system. You just download it, extract it, hit run, and it takes you through the process of installing the required libraries to the right folder. This is important, as Arduino is all about having things in the right place. The new release of the Library makes it easy to select the right drivers for your type of LED. I am using the old version of this library now Deprecated, as, like I said, these LEDS are a bit long in the tooth these days. 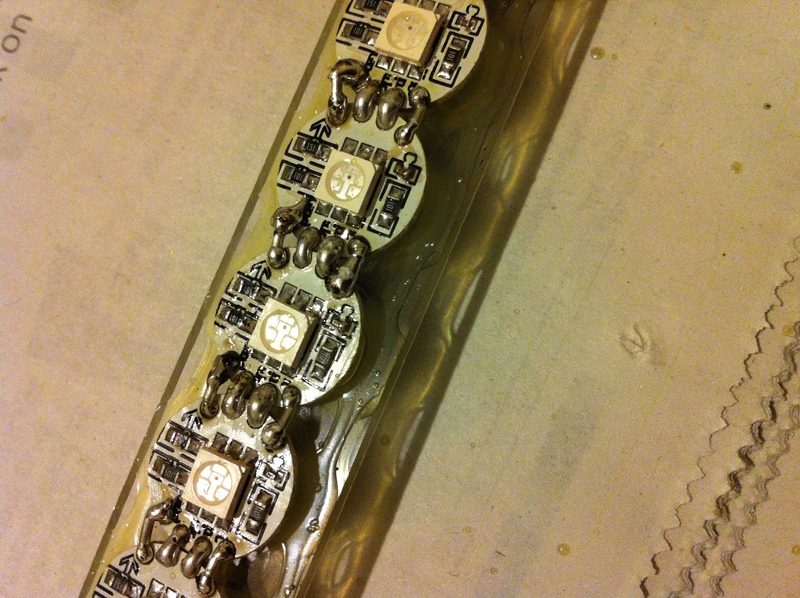 Talking about different LEDS and their drivers, here’s a picture of a row of single LPD6803 5050 LEDS all soldered together to form the POV row, set next to a strip of newly available WS2811 5050 LEDs. A little bit shorter, a lot lighter (weight), almost no soldering (and so probably more robust, and saving three evenings work). One thing to think about, though, it to make sure that the ws2811 chip (or which ever one you go with) can handle the refresh rate. By the way, these 5v strips are cuttable, show the direction of data travel for easy recognition of which end to wire up, and also use only three lines to work – ground, live and data. 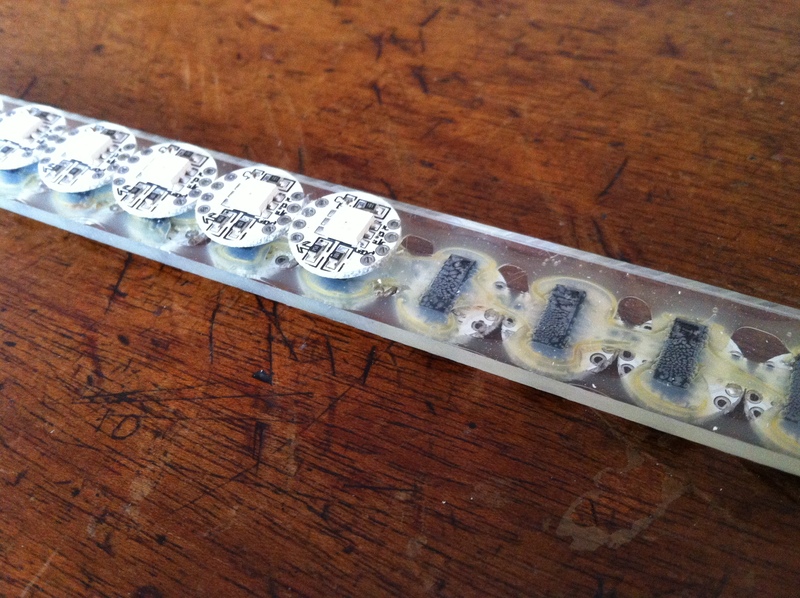 These Leds, when soldered together, act as a strip or chain, similar to the strips of addressable leds that you can buy off the shelf. As I said above, you are probably better off going down the route of a strip seeing as you can buy them at a good densitiy now. 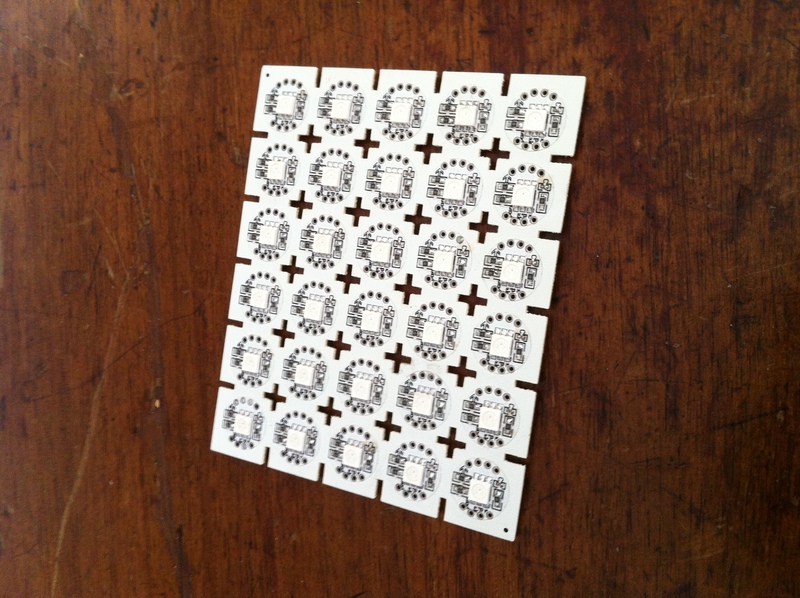 The LPD6803 individual leds have four wires, +ve, ground, data and clock. You may well find that when you come to wiring things up, you will have to share the ground pin with that of the arduino / Teensy in order for the Leds to behave correctly. – write our methods to go within the loop. There are a couple of different ways that Graphic (pixel) Poi are used. Firstly they are used to display images, such as a picture of something, and secondly they are used to great effect to show abstract patterns. Personally, I think that their greatest impact is in showing really good abstract patterns in sequences that catch the eye. In this blog we will initially focus on the abstract pattern element as this is the easiest part. was pretty disgusted to see this thing going into straight business profit , its cool to make money , but hey , look at home of poi . then there you are , sharing the specs to make my own , honestly , love you dude . First of all thanks for the information shared by you on Graphic Poi, it was a very useful article. Need to know a few more things about it ..like how to use time shifters ( if it is necessary or optional ) to make a graphic poi of 72 multicolor LED s. on both sides of the ( back to back i.e. 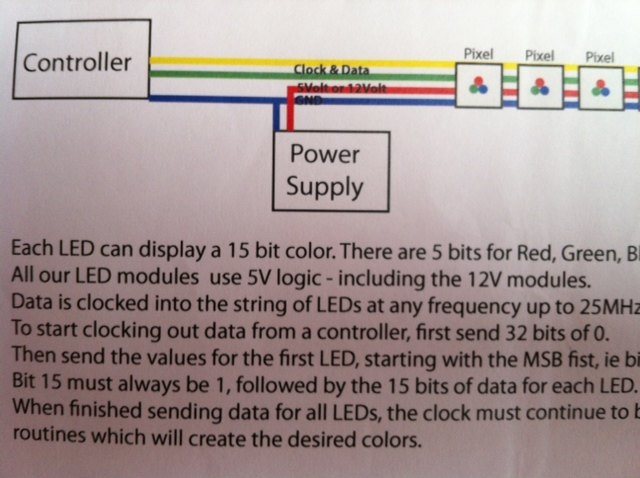 36 LED’s in front and 36 LED’s in back side ), also want to know if it is compulsory to put a time shifter in between them ..as i have seen the graphic poi from A-pixeltoys , it is having a few chips ( or anonymous part) for every four LEDs , can you plz help me with that part ..I am not a person with too much of knowledge with such instruments , just trying to make one for me .. Please help me . .
i am working on the way you describe ..
lets hope for the best ..
one i will finish the project . i will share the results with you . Good luck. 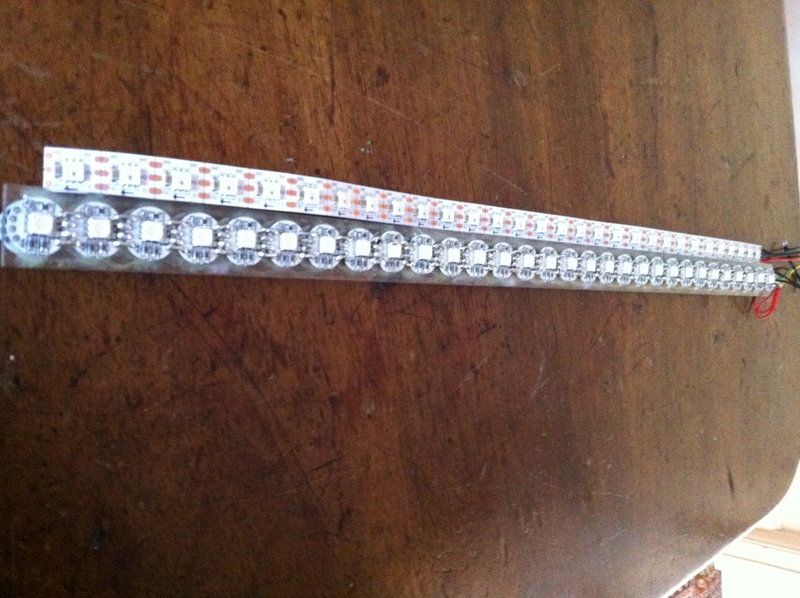 Important to remember that some of the LED strips do not run fast enough for POV, so do not use these. I found that ws2811 was NOT fast enough for POV.